A British ticket-holder scooped more than £45million in the EuroMillions draw last night. It is the latest big win for the UK, coming just two weeks after Mansfield couple Gareth and Catherine Bull picked up £41million. No-one had last night come forward to claim the rollover jackpot, but the prize is seventh on the list of the largest jackpots ever to be won in the UK, totalling a life-changing £45,160,170.50p. The winning numbers were 3, 15, 17, 28 and 33 and the Lucky Star numbers were 2 and 4. A spokesman for lottery organisers Camelot said: ‘We look forward to paying out this lucky ticket-holder and of course have the champagne on ice. ‘It is fantastic news to have another UK winner so soon after Gareth and Catherine Bull from Mansfield won £40million. Over the last three years, Britain has been dealt some massive jackpots. A spokesman said it was only as far back as 2007 when the biggest lottery winner here collected a mere £35m. The odds of matching all five balls and the two Lucky Stars to win the jackpot is 1 in 116,531,800. Nine countries currently play EuroMillions – Austria, Belgium, France, Ireland, Luxembourg, Portugal, Spain, Switzerland and the UK. France is the luckiest of the lot, having had the most jackpot winners since the draw started on Friday, November 13, 2004. Camelot said Friday’s jackpot is an estimated £12 million. 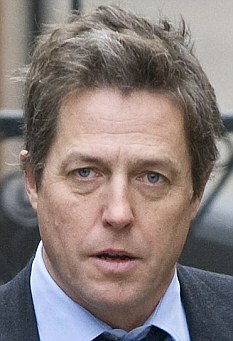 If the £45million jackpot is claimed by an individual, it will make them as rich as actor Hugh Grant, according to The Sunday Times Rich List 2011. But it still leaves them quite some way behind other big UK winners. The biggest-ever EuroMillions prize received in the UK went to Ayrshire couple Colin and Christine Weir who won £161million in July last year, making them almost as wealthy as the Beckhams. Another anonymous ticket holder collected £113m, while and Dave and Angela Dawes, from Cambridgeshire, scooped £101m in October. The fourth-biggest EuroMillions prize winner in the UK collected £84million in May 2010. 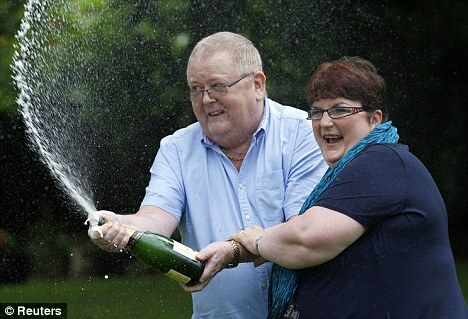 In February 2010, Nigel Page and Justine Laycock, from Gloucestershire, broke the then record with a £56million win – now the fifth-biggest prize in the history of EuroMillions. The sixth-biggest payout went to Les and Sam Scadding in South Wales who won £45millon in November 2009.